The RainyDayKitchen folks have been cooking using the sous vide technique for much of last year. The ziplock-bag/water-immersion method is an amazing way to cook food such as steak, chicken, pork, and sea food. The food cook must still be flash-grilled to give it the “finish,” though. While that is not a problem when the grills are out, it can be inconvenient during the colder months when nobody is particularly interested in standing on the back deck in a parka in order to create that perfect look for their food. Creative northern chefs sometimes use a blowtorch to sear their sous-vide-cooked food to give it the right color, look, and flavor. But that comes with it’s own challenges, including the fact that hardware-store-bought blow torches are meant to cut through metal and might be a little overkill/dangerous in the kitchen. 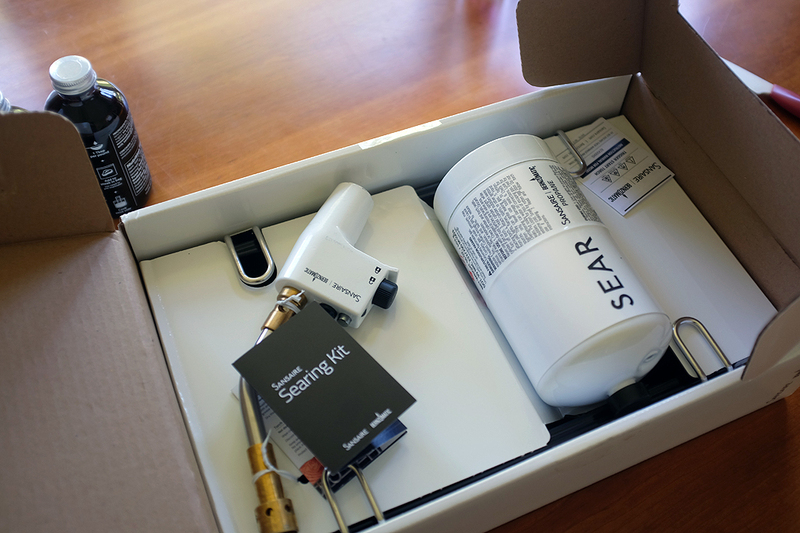 Sansaire, working with BernzOmatic, have put together a package for those who want something powerful but more kitchen-friendly to go with their immersion cooker. The torch head, created by BernzOmatic, is the most powerful culinary blowtorch ever designed for home cooks. The Sansaire torch delivers a wide, roaring flame at over 2,200°F. Other kitchen torches—like the typical creme brulee torch—can’t compete with that kind of power. The Sansaire torch head features an extra-large brass tip for an even distribution of heat, a run-lock that provides continuous operation and one-handed ignition with safety lock for ease of use. The thing we noticed immediately when taking the gear out of the box is the quality of the components. The rack is made from heavy-duty stainless steel tubing and should have no problem standing up to the high temperature flame from the torch. The rack also has cleverly integrated handles and feet into its design. The drip pan is made to slide into and under the rack to catch the liquid from the meat released during the searing process. 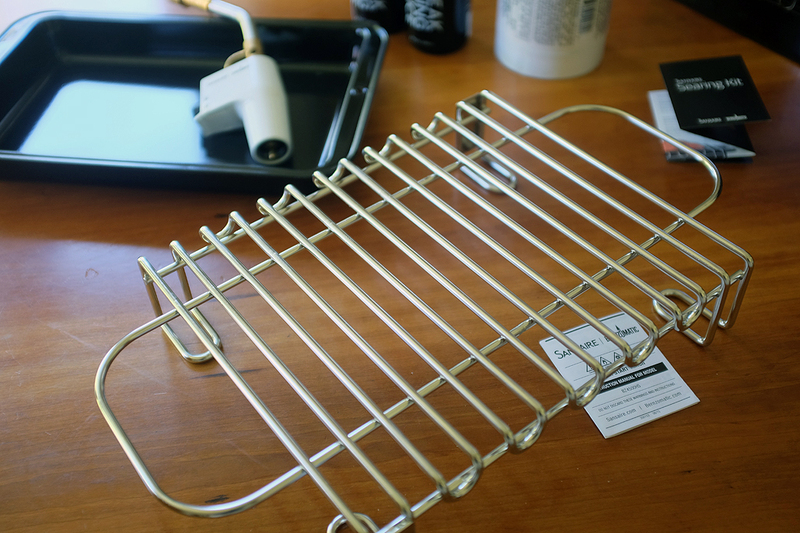 The enamel coating protects the pan while ensuring easy cleanup. 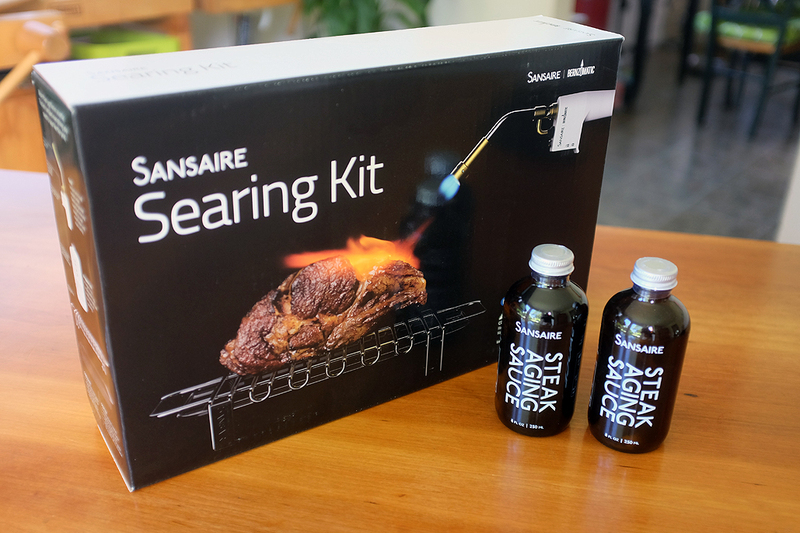 To complement the Searing Kit, Sansaire has prepared a special “aging sauce” to give any steak the complex flavor of dry aging. The sauce is formulated with a high concentration of glutamic acid, the naturally occurring molecule responsible for the umami flavor in aged meats! 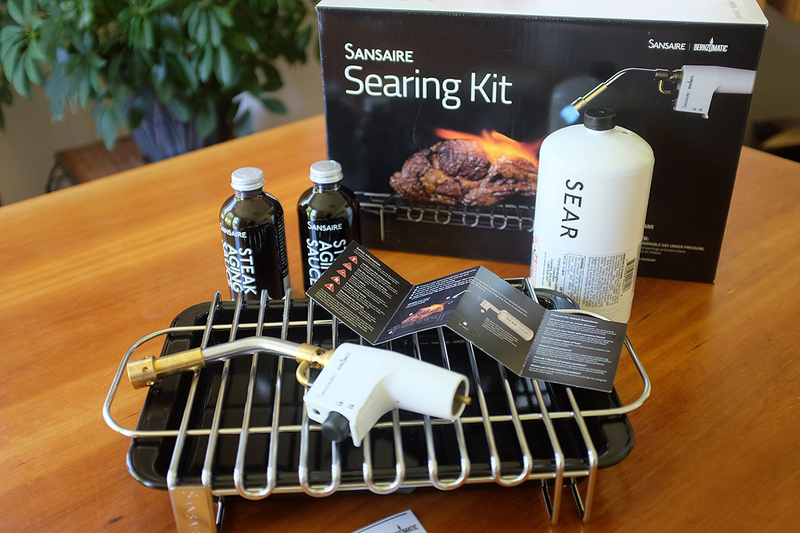 We are looking forward to giving both the Sansaire Searing Torch and the Aging Sauce a try in our next sous vide/grilling event.